Jay Stuckey is happy. His paintings, hung salon style, floor to ceiling on one gallery wall have an overwhelming presence and in many ways can be read as a narrative. The works both small and large, are cartoony representations of men and women: perhaps the artist and his significant other(s) as they frolic, dance, obsess, contemplate and play. 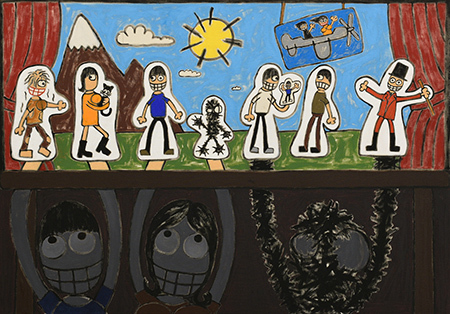 The figures have exaggerated features — huge eyes, mouths and other body parts — and are presented in imagined scenarios. "Walking with Sharks" features two embracing figures in bathing suits, who are waste deep in water filled with sharks, or in “Help," where numerous male figures are presented in a boat seemingly in flames, surrounded by water filled with chomping animals waving small flags. Interspersed with the figurative works are crude paintings of cellphones with text messages — one from Donald, one from Hockney and one from Werner. Here Stuckey is being coy, ironic and playful. Also scattered along the wall are paintings that contain notes, doodles and sketches for the larger works. These pieces can be seen as paying homage to Jean-Michel Basquiat and Philip Guston, and illustrate the complex intricacies of Stuckey's thoughts and process. There is much to see and take in in this compelling installation that is aptly entitled, "Bye Jay Stuckey, by Jay Stuckey."